What children wear is disposed by the parents. That statement impressed me upon my reading on an article in national newspaper last week. It enlightens the phenomenon nowadays where children fashion becomes a business, particularly in big cities such as Jakarta. Popular brands, previously working on only adult market, now are embracing new field, accordingly children market. Not to mention the name of the brands, I am sure that they are well known. Children, of course, don’t know if the apparel they are wearing is branded or not. Parents who know exactly about it. They don’t have any right to decide what is suitable for them and sometimes parents think they know what’s the best for their children. In such condition, they can’t explore what they want. When parents give more spaces for their children to explore what they want to choose and wear, it will give an opportunity for children to trigger their creativity. Well, it’s just an intermezzo. Principally I haven’t had any idea how to be a mother as I’ve never been there. And I am afraid that I will be one of them, parents who under utilize children’s creativity. Being raised by a mother, who’s a career woman, as a daughter I wanted to follow what my mum was doing. I was dreaming as a career woman as well. I think it’s a natural because I was living in an environment where I looked up my mum as a role model. Building pathway there, I studied hard while keeping choose the career option suitable for me. I found what I wanted to be when I was in a senior high school. Diplomat, i thought, was cool after reading a story about an Indonesia ambassador. Okay, the fact that I am not becoming a diplomat didn’t make my parents disappointed. Instead they could really understand that finally I indeed never wanted to be there. Many considerations why I never applied to that institution. And now I am working in telco company, a new field for me which doesn’t make me inferior but on the contrary gives challenges for me. Before entering a real work-world, I never paid attention about career option in non-formal path, being an enterpriser, for example. I have several friends who build successfully their business. And even I get envy with my husband who has more flexible time than me. Chatting with a friend several days ago, she gave me an enlightenment about working as enterpeneur. She elaborated several advantages working at home (she owns an online boutique). The best advantage is having much more time with children at home, which is the most precious one. I share similar idea with her. Looking the condition I am facing now, the time I have with my husband is limited due to my work thingies. Even it’s only 8-5, we think it doesn’t really worth except for weekend. Just can’t imagine how much time I can devote to my children later, if I remain working this way:((. My husband keeps encouraging me to start up a business. It’s not easy for that who has a labor-mentality like me:D. I have to learn with him and my other friends who are in their way to build a business and dare to leave their nicely-paid job. What about you, my deary fellas??? It’s been more than one year my dad has been being assigned at Bandung, but he’s still blind-route. One and half year ago, not long after he moved to Bandung, we (my mum, my brother, my granny and I, visited him for the first time. Enthusiastically he took us around Bandung. At that time his knowledge about that cool city wasn’t much. He had to rely with some instructions from his friends at office. However, we did understand as he’s just knew barely about Bandung and its confusing routes:D.
Several months ago, again I visited my dad. With my mum, we had several itineraries there for my wedding preparations. We hunted clothes material and souvenir for siraman. Still, my dad’s knowledge didn’t improve. It took several loops to leave Pasar Baru Bandung to his favorite restaurant. He drove while keep wondering if it was the correct route he took. My mum and I just laughed at a man we both loved. My dad didn’t change. He is still a nice man even when getting lost:D.
Last weekend, for the first time after married, my husband and I came to see he again. He was so happy and overwhelmed knowing that his daddy’s girl would be visiting him. He promised to take us wherever we wanted. His offer of course was irresistible, too good to be ignored. Lucky us to have him because Bandung was rainy almost all day. And the similar thing did happen again. We got lost with dad. Many people to ask for direction to train station. When taking us to the flowery hill at Lembang, he took wrong turn. Ugghhh. I never go anywhere. I go to the office in the morning and back to home after five.After that, i choose staying at house rather than going out. That’s how he defended his poor knowledge on the route. it’s reasonable as it only takes a minute for him to go to the office. He resides at home in one neighborhood with the office. And he is often accompanied by a driver once going anywhere. Afterall, my dad is a nice companion for us. He drove along the way without hesitation. He didn’t mind taking us to FO for shopping. Sometimes he still insisted us treating us for lunch and didn’t mind at all if we wanted to spoil him. Everybody knows what mothers in the world go through when they deliver baby. More or less nine months before, mothers struggle to raise the baby in their comfortable womb, feeding them through nutritious food. Once delivering us to the world, it isn’t painless. It’s believed they are close with the death. However, my mum said that her hurt gone when seeing the little baby close to hear and feeling my heartbeat. No matter how the children can grow as “b*****d, mum will always their savior. Their lovely-caring nature is an oasis where we can always rest. For their children’s sake, they become unbelievable heroine. In my home at Jogja, we employ a local as helper. Her name is Lik Sus. She’s a widow with two, the youngest one is at third grade, elementary school. Lik Sus said to my grandma that she always supplies one egg for her children at least once a day. For that, she’s more than willing to eat only with sambel (chili sauce). She wants her children get nutritious food. In the mid day, she picks her youngest with bicycle from school, regardless the hot sun exposure. A story of Woo Kap Sun who never stops encouraging and being extraordinary companion of her daughter maybe inspiring for us. Her children, Hee Ah Lee, was born with congenital deformity. Since the very beginning, Woo Kap Sun rejected the idea of giving her baby to orphanage. Instead, she took care of her baby with love. She poured care and passion to the little daughter. Ah Lee, for her, is magnificent gift God gives to her. When Ah Lee went six, Kap Sun taught her to play piano. It took extra patience to teach a daughter who only has two fingers at each hand. Kap Sun’s patience is fruitful. Ah Lee becomes a pianist with a great performance. She’s now a famous-talented pianist with world-class quality. What can Kap Sun say more other than thanking God for giving such gift? There are lot of story about great mothers, and I am sure you have your own story. A mum….an angel God sends to the world. Ever since I live apart from my family, going home is my favorite activity, especially when it comes to ramadhan then continues to Eidl Fitr. In Eidl Fitr, everything turns more special as all of familiy members gather and it’s the moment when we can meet each other and forgive each other. Being at home with family is a priceless moment, especially for me. I am used to live apart from my family since several years a go. I live at Jakarta, my mum is signed at Cirebon, previously at Semarang, and my dad is at Bandung, before he’s at Yogyakarta. My grandma and my younger brother stay at Yogya. Thus, I couldn’t say there’s anything more precious than having them near with me. I am more than sure that it’s also why poeple do “mudik” every year. A missing feeling of a place to call home. It’s the ground of that action. Mudik isn’t merely a ritual or an activity done year by year. It’s a time when poeple going home and finding their true life after going to the battlehill, earning cent by cent to survive life. City is the place where they look for material, and going home is their sanctuary where they find the divine spirit. It also drives people more than willing to stand in queue for hours to get ticket. It’s also why people put their life at risk by clinging only to a part of locomotive(which is very far from safe). And it’s also why people don’t mind drowned in crowd of economy-class passengers or sleep at train station, wishing they can get one or two available seats the day after. Every body just wants to be home. My dad didn’t mind at all to drive from Cirebon since the 5 AM until 4 PM to arrive safely at Jogja. Though he knew i took much longer than usual trip. Neither did my Mum. As for me, I never counted the price I should pay for seeing them at our lovely home. I could meet my family and my new family, accordingly my husband and his big family. We’re united at one, at place called home. ps: for us who are in struggle to build our own home- sweet-home:). Jiayou!!! 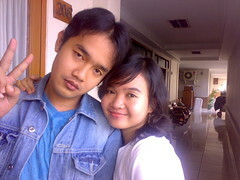 I had my long weekend with my husband at Jakarta, not at Jogja this time. Then on Sunday, I returned to traditional market after being so long not visit it. As a new couple, we needed many things to start up the life. Accompanied by lovely husband, I went to Pasar Minggu which happens not so far from our house at Komplek Hortikultura. Vegetable, ingredients, spice, tofu, tempe and chicken were on my to-buy-list. It’s for the first time I went to the traditional market at Jakarta. I think it’s not really different with those at Jogja. I love the condition, the crowd and bargaining process involved in traditional market. Hopefully we can go there once in a week to fulfill our basic need for one week. I started cooking for me and my husband since Sunday. It’s a little bit difficult to spare time for cooking in my hectic daily activities. Waking up in the morning, usually I prepared simple breakfast for my husband, such as cereal with milk. But for weekend, it’s should be special. No more cereal. I promise to him to cook more often and he does agree with me. Besides healthier, cooking by myself is much friendly to monthly budget. Isn’t it hun??? Yesterday I raised a question to my husband to-be if he’s happy that we’re going married, and he directly asked “what about you” after answering that he’s very happy. I conceded to him that my feeling was mixed, happy, overwhelmed, nervous and sad at once. Why sad? he continued asking. My sadness isn’t groundless. Once I’m married, I no longer solely belong to my parents, I have another person who will take care and responsibility of me. It’s about sentimental feeling that obviously emerges from inside of me as I consider my self haven’t completed and paid back what they have done to me. For the tears and sweat dropped from them that money can’t buy. Many times before, I kept asking my self if this marriage they really wanted from me. I knew I couldn’t pay the purest love they give to me or even give a price over the parental bound of us as it’s too precious and priceless. My parents are obviously embodiment of the purest love I’ve ever received and I am hopeful that I can give the similar toward my lovely family. Then I know, they couldn’t be happier seeing me with the man who I love. They are very welcome to have one son who will share his life with me. Thanks mum, dad for the thick and thins you went through to survive me. Today, my lovely brother is celebrating his 21st birthday. Four years ago, when I was 21 years old, I already graduated from college and obtained bachelor degree. Guruh hasn’t. Yet he gets a plus point. In his early twenty, He’s already run his own business. In the mid of this year, he plans to continue his study again, back to college he left for almost one year. It’s very glad to know that he’s no longer a happy-go-lucky boy. Finally, he found a turning point which made him more mature and wiser conceiving his future. A little bit surprise for us, especially my mom and dad knowing that he’s eager to start business. There was a debate before giving his choice a go. People of Okinawa and Sarnidia are known to have a healthy long life-span. It’s not only because they apply healthy habits such as consuming more fish and soybean than the average, exercising regularly and sufficient rest. Based on the article I read on kompas.co.id this morning, those group of people also have a very lovely culture, accordingly respecting elders. The feeling of having sufficient love, warm spirit, as well as a close friendship do have great impact over our healthy quality and wealthy. The proofs of touching impact have been revealed by experts. Not to mention the benefit of laughter and social involvement toward the one’s healthy. All of them shows that the good interaction and relation with others are decisive in our healthy. A research reveals that husband and wife, who receive enough hold and touch within their relation, have a stronger emotional binding than those who receive less. It’s also said that a child who rarely gets hug from parents feels less secure compared to children who get the sufficient affection expression from parents. Meanwhile, feeling secure is very important to the children personality development. If one often has headache, migraine, insomnia and likes to see other disappointed and failed, maybe he/she doesn’t have enough love, rarely loves him/herself, and rarely get attention from her/his couple. So, do you love yourself? Have you said that you love your friends? Have you given the warmth to your couple??? Better to start it right away because the power of love is exceptional. Yesterday my mum asked me to make a video call toward her number. I knew that she’d been long interested in using 3G technology, including video telephony. Then I called her. I could see her tired face after because I called her in after-hour, the time when she’s done with her office business. She smiled and looked very enthusiastic. Knowing that, my friends weren’t less enthusiastic. They stood at my back and were very curious with my mum’s face. My mum then became so shy. I should admit her enthusiasm. Being of fifty-something, she knows relatively much technology than average women in her age. Just call her number; you will hear a cool and update ring back tone. While for the ring tone, she chooses her fave song, Jude by The Beatles. I remembered when both of us searched for ring back tone in one of operator website. Meticulously she selected songs one by one and heard it in the headset. She’s not irritated with new song because songs by Tamia or Shelomita were one of her selection. Then, the choice went to Shelomita’s song. Once I wanted to withdraw money from ATM, I kept in mind she jumped out from car and got in to the ATM box. I wandered what she would do. I thought she just would withdraw money like I did. Surprisingly, she asked me to teach her how to transfer money through ATM. I let her know step by step and know she becomes a frequent user of that technology. Just keep your enthusiasm and curiosity mum. That’s why I’m proud of you. You never wanna stop learning anything.